We have recently started dealing with Aquaflex a long running trade only cover and liner manufacturer who are based in Salisbury. 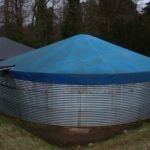 Please contact us for a quote for liners, covers, rollers or even a bespoke cover for example for a water storage tank. Almost any size pool or pond with any size or shaped steps. 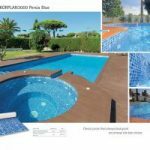 Suitable for new pools and renovating old concrete or plaster pools. Suitable for ponds and lakes. Suitable for domestic or commercial pools. Wide variety of colours and patterns, including bespoke options for motifs. Winter protection is vital for any pool and Aquaflex’s winter debris covers offer the perfect solution to keeping leaves and other unwanted items out of the pool whilst shielding the pool water/liner etc, from what even in the winter can be damaging UV rays from the sun. 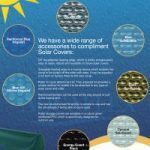 Aquaflex provides the complete range of solar covers for heat gain/retention in swimming pools. 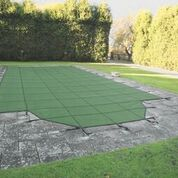 From the economy grade 400 blue covers, mainly for above ground pools, through the efficient SolGuard/EnergyGuard product range, up to the more robust Reinforced covers, Aquaflex has it covered. Our top recommendation would be the Gold GeoBubble with its peanut shaped bubble, it has been scientificially designed to be more resistant to chemical and UV attack, than a traditional bubble, as a result the lifespan will increase by 25% +. The best budget option is the Blue 400 Micron. …the luxury domestic reel system at a realistic price!. Available in 2 different sizes for pools up to 20’/ 6.4m wide. The Monaco Premier includes SmartGear which makes cover removal super easy. Monaco Sunreel has a solar powered electric motor which does all the work for you at the twist of a key or can even be remote controlled, so all you need to do is press a button! 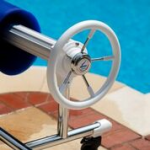 Monaco Commercial rollers are available for pools up to 32′ (9.75m) wide.